If you played the first Splatoon on WiiU, you'll likely recognize the boss' formula. Just like before, he'll try to punch you silly with his extend-o arms, and it's your job to knock those suckers back before he lands a killer hit. But, Octavio likes to change things up this time around. See what to do for every phase, and what weapons (and weapon upgrades) we recommend to make this battle easier. Before entering the last boss area in Area 5, you'll want to pick up a few upgrades at Sheldon's Ammo Knights Enhancifier Terminal at the very start of Octo Canyon. Recommended: Purchase the Level 2 Hero Shot Upgrade and the Level 2 Ink Upgrade. The Level 3 Hero Shot will help make this boss much easier too -- but if you don't have enough to buy it yet, don't sweat it! Make sure you equip the Hero Shot before entering the final boss stage! You can exit at any time and reselect your primary weapon with [+] on the Nintendo Switch. Okay, let's get started! Phase 1: For the first phase, Octavio uses three primary attacks -- when his fists glow, he launches them in an arc toward you. If they spin, they'll launch directly at you, and he'll also launch multiple ink bombs right at you. He'll also use his shower attack, leaving a huge streak of enemy ink as he moves across the arena. Quickly take back that territory with your Hero Shot. To avoid the ink bombs, you'll need to ink as much of the arena as possible. When Octavio isn't shooting his slower-moving vulnerable fists, you'll want to constantly ink the arena to give yourself plenty of room for quick squid-form escapes. To damage Octavio, aim for the slower-moving arc punches. These glow pink and don't spin -- shoot them and the fist reflects back on Octavio, dishing out damage. Avoid the spinning punches and ink everything! After reflecting about 8 punches, his vulnerable weak point tentacle will appear. Ink it to defeat the first phase! Phase 2: For this phase, Octavio moves faster and uses more attacks -- he'll often launch both fists in tandem, too! Watch out for the upgraded ink bomb, and when he launches the little brown balls, shoot them before they become dangerous geysers of enemy ink. Like before, you'll want to shoot the slower-moving, arc punches. Watch his arms and start shooting before they splashdown -- but you can still shoot them, even when they're embedded in the arena floor. They retain their ink damage and only reset when they're reflected back. It takes about 8 reflects to complete Phase 2. Watch out for those double-punches -- Octavio will mix things up and throw a spin-punch with a regular punch. You'll take serious damage if you get hit with both punches at once. Phase 3: Marie saves the day! With a single sniper ink shot, she frees Callie from the hypnoshades. 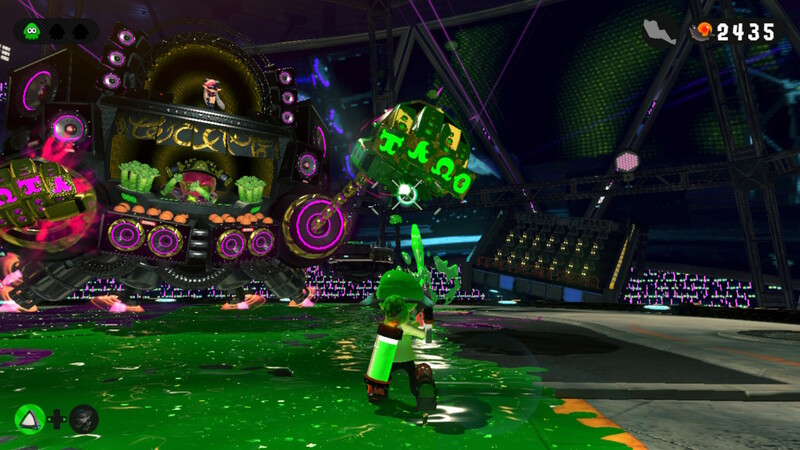 DJ Octavio goes into hyper-attack-mode at this point, and you'll have to start re-inking the arena right away. Like before, it takes 8 reflects to reveal Octavio's weak point. This time, he moves faster and will dodge left / right while punching. Don't worry, just watch the punches, not the DJ booth! He uses a few nasty tricks here -- he'll launch bombs or punch in quick succession, so always be alert and ink everything you can so you can make a quick escape. Phase 4: Here's where things take a turn. After smashing DJ Octavio's tentacle three times, Sheldon will deliver a modified Rainmaker! Instead of making things easier, this actually makes the fight a little tougher! DJ Octavio flies, and you'll have to ride a pair of grind rails up to face him. You'll be stuck moving one direction, but you can still jump and switch rails to avoid attacks. At this point, Octavio only uses regular (reflectable) punches and spin punches. To avoid the spin punches, wait for them to get pretty close, then hold down the jump button for a higher jump. Remember, it's important you wait for the punch to get close -- don't jump right when it launches or you'll eat a knuckle sandwich. Charge the Rainmaker and launch when the reflect-punches are close enough to aim at! Or, you can lead them -- either way, even if you land a direct hit, JUMP! The Rainmaker takes awhile to reflect the punch, so even if you get a successful hit, that punch can still hit you. Swap rails or jump to avoid incoming spin-punches, and just keep pounding away at the regular punches with the Rainmaker. It takes pretty tight timing, so be patient -- it also helps to enter this part of the fight with three lives remaining, just incase! After knocking back about 8 punches, DJ Octavio's booth will crash and a new third grind rail will appear. Ride it down and you'll automatically jump on Octavio's head, defeating him for good! And that's all it takes to complete Hero Mode in Splatoon 2! Enjoy your rewards, then get online for even more splatting fun.